In Part 3 of this series, I talked about the levels of attention we experience in an average day and the importance of leveraging our proactive attention in particular. We need discipline so we can overcome internal and external resistance. The following tips and tricks will help you achieve that by mastering two main areas: managing your attention effectively and mono-tasking. Realising the need to get beyond time management and starting to manage your attention to its optimum capabilities is a huge step forward. Develop a good sense of your daily attention flow so it dictates the rhythm and difficulty of your work at different times of the day. Give yourself permission to handle the low brow and easy tasks when you are flagging at inactive attention lows, but equally be sure to bite off the most difficult tasks when your proactive attention has you salivating for results. Remember, proactive attention is your most precious commodity. The vultures of interruption and potential distraction will circle you, trying to make you a victim. Stay in control. Aggressively and ruthlessly defend your attention. 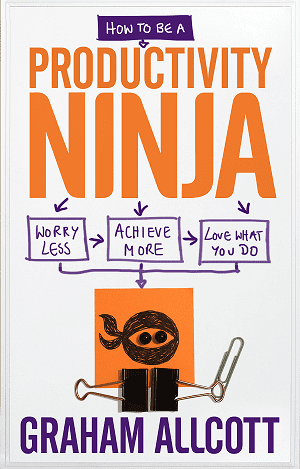 A productivity ninja is agile. The plan for the day at 1 PM may be entirely different from what it was at 9 AM. Pay attention to your attention levels and change your plan if you are having one of those ‘hitting top form’ kind of days, or of course if you are fading faster than you expected. With any new activity, whether email, writing a report or attending a conference, there is a high set-up cost in terms of time and attention. For email, you have to fire up Outlook and let the program load and synchronise with the server and open your emails. If returning to a report, you have to reread all the bits that you have forgotten you wrote last time; you have to navigate back through the document. All of these are the set-up costs of doing. The cost is twofold: It takes time and it also takes attention and energy. Working in larger ‘chunks’ (such as writing the whole report in one go, rather than trying to split it over several days) is a great way to minimise the time and attention spent in set-up mode. Potential distractions are around every corner. Do not even create the temptation to get distracted because you are bored. Keep your days and weeks fresh by giving yourself variety. So if Monday is very much a solitary thinking day, perhaps Tuesday will be full of interesting people and conversations. Wednesday might be out of the office, but allow Thursday to focus back onto admin and getting your in-tray back to zero. There is no worse invention in old-school time management techniques than ‘multitasking’. This is really about juggling two or more actions at the same time and requires your brain to switch into one thing, make a small amount of progress, switch to the next thing, react to something else, come back and make minimal progress on the first thing again, and so on. In trying to manage our attention this way, we expend a lot of energy and attention on the costly mental set-up time and create constant drag away from actual doing and completion. A much better idea is ‘mono-tasking’, the art of doing one thing to its natural conclusion and without interruption. Regular mono-tasking makes you feel more present in your work, more engaged, calmer and more at ease with the world around you. As we sit down ready to mono-task, we are reminded of nags, ideas and other actions, which tempts us into checking our email or succumbing to external distractions. We need to be capturing and collecting any potentially useful ideas, allowing us to return fully to what we are working on without the need to disrupt our flow too much. Make your capturing as easy as possible. Capture into your phone or onto a piece of paper rather than change what is on the screen. Experiment with finding the quickest, easiest, most friction-free ways to capture. The Pomodoro Technique observes that short bursts of attention (25 minutes) followed by short breaks (five minutes) are the best way to preserve your proactive attention throughout the day. By splitting the day into lots of 25-minute chunks and using a timer that counts down, you spend the whole day with the constant buzz of being up against a clock. It is a great tool for splitting much larger tasks down into more bite-sized chunks. It can help provide an important sense of focus and can help you resist the temptation to give in to distractions. You can download Pomodoro timer apps or download a desktop timer for your computer. One of the good things about Pomodoro is knowing that after every 25 minutes of work there is a five minute comfort and distraction break. If you find yourself procrastinating, do not beat yourself up for doing so, simply create the right boundary. Think to yourself “OK, five more minutes of this procrastination and we are moving on to this specific thing.” This demystifies and disempowers the procrastination and often moves you along at the end of the five minutes and into what is required of you, now that you’ve ‘had your share’. The Power Hour idea is simple. Schedule an hour of your most proactive attention to work on what you are avoiding. Add it to the diary so it is not a possible option, but a commitment. It brings focus, and by the end of one Power Hour you will probably have delved deeply enough into the activity to know that it is not quite so scary or difficult after all. Remember, you can only have one Power Hour each day. The focus on consistently doing one thing well is what counts here. Trying to schedule seven Power Hours a day just leads to stress and disappointment. You will also find Power Hours easier if you can tell your colleagues that you are doing it and ask for their cooperation in not interrupting you during that time. Anything else you can do that might subconsciously create a signal that this hour is special and different from all the rest will really help too, whether that is putting on your favourite music or drinking expensive herbal tea rather than the usual ‘normal’ tea. We hope you have enjoyed this series on ‘productivity ninja’ techniques. Being a productivity ninja is about developing an overall mindset to deal with the enemies of information overload, procrastination and stress. It is about developing your Zen-like calm, knowing your tools and being prepared, knowing when to be ruthless with yourself and your commitments, being mindful and agile, and occasionally practising ninja stealth and camouflage. Graham Allcott is the founder of Think Productive, a training company that specialises in workshops that boost productivity. Realising he would have to manage without a PA and his great team of ‘do-ers’, Graham began reading about workflow and productivity tools, developing his own ways of ensuring maximum productivity. More recently, he released his book "How to be a Productivity Ninja. Forget time management: How to get things done in the age of information overload".